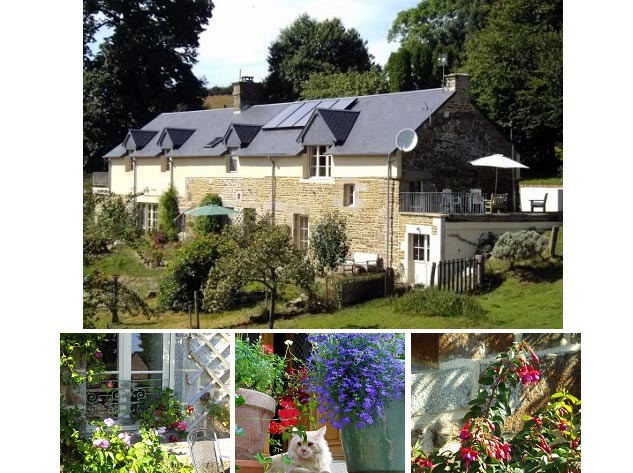 La Fosse is a charming and comfortable bed & breakfast / chambres d'hôte, located in the green and wooded heart of the hilly countryside of southern Manche, Normandy. It sits in a hamlet of only three houses spread across a sheltered fold of a south-facing hill just outside the tiny village of Perriers-en-Beauficel, Manche. 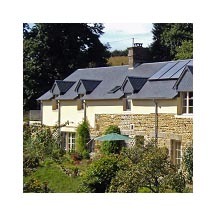 The setting is superb with panoramic views of wooded hills and valleys in every direction. We are within a short drive of the bustling market towns of Vire, Mortain, St-Hilaire-du-Harcouet, Avranches and Sourdeval. La Fosse is a typical Norman longère - or "long house" - and sits in its own grounds in this beautiful and tranquil region in Manche at the base of the Cotentin peninsula. Parts of the house date back to the 1700s when it would have been several farm workers' cottages but it was extended over time, eventually managing to escape unscathed from the ferocious fighting that took place around the hamlet in August 1944, several months after the D-Day Landings of June that year. Over the past 10 years, we have restored and renovated to a high standard, keeping it's character but making it a warm and comfortable family home... and the perfect location for you to relax and get to know this fascinating and varied region. Or take a gentle - if hilly! - walk. From the top of the drive, there are panoramic views whichever way you choose to go. The house is surrounded by cider apple orchards and hilly farmland – mostly populated by cows and sheep and the occasional crop of cereals. La Fosse faces south over the Sée river valley which runs west until it meets the coast at the Baie du Mont St Michel about 30 minutes drive away. It is the perfect location from which to explore the area and a few days is not enough: it is within easy reach of the towns of Vire, Mortain, medieval Domfront, Avranches and stylish Granville. There are forests, a national park, fashionable seaside and spa resorts, exceptional beaches with more than enough space for everyone – even in August. There’s history ancient and modern, day trips to offshore islands such as the Iles Chausey and the Channel Islands and of course, a visit to the stunning Mont St Michel. Bayeux, its tapestry (or embroidery, to be more accurate) and the D-Day beaches are less than 90 minutes away. In this part of Normandy with so little traffic on the roads, driving anywhere is a pleasure. Or bring a bicycle to explore the local hills and valleys. If our hills are a bit challenging, take the bikes out by car to explore further afield – there are many (flatter!) coastal roads and beach paths - and the voie verte (green lane) that can be walked, cycled or ridden from Vire / Sourdeval towards Mortain and continuing in the direction of Mont St Michel is only a few kilometers from La Fosse. We also manage our land to encourage and assist the wildlife we have. Information about what we're doing to help the environment is in the Living Green tab below.